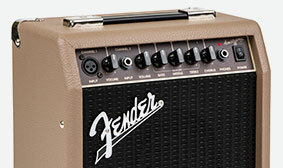 For more effective high-frequency response, the Acoustasonic 15 bears the unusual distinction of being the only Fender guitar amp to use a "whizzer" cone—a small supplementary speaker cone attached to the voice coil of the amps 6" speaker. 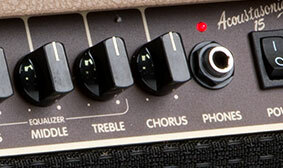 For extra ambient depth and shimmer, the Acoustasonic 15’s instrument channel features a built-in chorus effect. The Acoustasonic 15’s convenient dual front-panel inputs include a standard ¼" jack for an instrument and an XLR input for a microphone. Instrument Channel: Volume, Bass, Middle, Treble, Chorus. 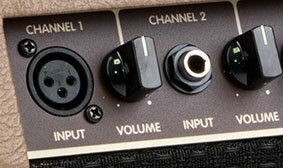 Microphone Channel: Volume, Bass, Middle, Treble.